What follows is more of a publication than a Blog. With the help of 3 boys and 4 girls whilst they were in year 10, we have successfully met the challenge given to us by the National Trust at Cliveden to find out something about the 15 Cliveden Estate workers, who lost their lives in the Great War 1914-18, and whose names are commemorated on a Brass plaque on the Octagon chapel at Cliveden. From a range of evidence arising from research carried out over a 3 month period, we were able to provide the National Trust with the following information, for release as an original publication to commemorate the 100 year’s anniversary of the Armistice declaration on 11 November 1918. The boys and girls are participating in a special event at Cliveden on Sunday evening, by invitation only. We are very proud and thankful of what we have been able to achieve. James Edwin Marjoram was born in 1891 in Binfield, Berkshire. He was a footman for the Cliveden Estate. Nancy, the wife of Waldorf Astor (the future Lord and Lady Astor) who owned the Cliveden Estate, loved her footman being really tall and big built. This implies that he must have been a handsome young chap. His last known address was in Windsor, Berkshire, where he lived with his beloved wife Edith Rose and daughters, Nora and Edna. When the war broke out he volunteered for service, 2 years before he would have been obliged to sign up due to conscription. His service number 11728 tells us that he joined the army at the beginning of the war (1914). He enlisted in Maidenhead, joining the Royal Berkshire Regiment (the 1st Battalion) and arrived in France on 29th November 1914. James was obviously a good soldier, because he was awarded the Military Medal. Promoted Serjeant, unfortunately, he was killed in action, on 8th October 1918, in front of Forenville, during the Second Battle of Cambrai (one of the last battles in the war, only a month before the Armistice). So it must have been devastating for his family; he had survived four years of battle, only to die tragically at the last hurdle. James died at the young age of 27 and is buried at the Forenville Military Cemetery, Nord, France. They have a memorial here at Cliveden in the Octagonal Temple for Sjt Marjoram. Frederick Everett Hurn was born in 1864. Formally known by his middle name (hence E Hurn on the chart), he had been a ‘regular’ in the Royal Berkshire Regiment of the British army before the First World war, evident from his army service number, serving in Egypt in the early 1890s before returning to Cliveden after the death of his first wife, Sophia in 1893. By this time, he had a four year-old son, also called Everett, who was cared for by maternal grandparents until Freddie got back. Freddie lived on the Cliveden estate and had worked as a night watchman at Cliveden for William Astor before enlisting in the 1890s; it seems that he was a reliable employee, whom Astor was willing to re-employ on his return. Freddie’s job as night watchman would have been to make sure all was well on the Cliveden estate after dark, a job for which he would have needed a degree of bravery, for sure! In 1901, Freddie married for a second time: Clara, the sister of his first wife. Even though he was 50 when war broke out in 1914, Freddie volunteered to serve again in the 6th Battalion of the Berkshire Regiment. His previous service obviously counted for something, so he became a sergeant; we might imagine him as the ‘old soldier’ setting an example to the raw recruits in his care, and them looking to him for reassurance. By 1915 he was at the front again and during 1916 he was Mentioned in Dispatches. By late June 1916, the men of the Berkshire Regiment were in position for the big battle about to take place: the Somme. On 1 July, when the battle began, Freddie’s regiment advanced with some success, despite finding themselves at the mercy of enemy fire; but Freddie was killed on the first day of this campaign, which would eventually end at colossal loss of life in late November. He was awarded the Military Medal posthumously. By this time, William Astor had gifted Cliveden to his son and daughter-in-law, Waldorf and Nancy. When Freddie left for France, and subsequently died in battle, Waldorf ensured that Clara was able to remain in Taplow in decent housing, a respectable war-widow. Until her death in 1934, Lord Astor paid her rent: a mark of the respect with which Freddie Hurn and his family was surely held by his former employer. The only estate worker for whom we have a photograph is Private Herbert Abdey, also of the Royal Berkshire Regiment who died with the Royal Berkshires on 15 October 1915 following their engagement in the Battle of Loos. We also have a photograph of his brother Private Alfred Abdey, who had joined the Royal Berkshires before the war and died in an Aldershot hospital on 5 August 1914, war on Germany having been declared the previous evening. The Royal Berkshire Regiment and the Battle of the Somme. Two of the estate workers, Serjeant Reginald Comley and Serjeant Freddie Hurn lost their lives fighting with the 6th Battalion, Royal Berkshires on the first day of the Somme, 1 July 1916. A third, Private Albert House, a reservist who had been in France with the 1st Battalion since September 1914 was killed at the end of July during the Battle of Delville Wood, one of the many subsidiary engagements of the Somme Offensive. On 1 July 1916, Serjeants Hurn and Comley along with the 650 other soldiers of 6th Battalion, Royal Berkshire Regiment (6 RBR) were entrenched in the Somme valley, near Carnoy. Part of 53rd Brigade, itself a constituent of 18th Division, the Battalion was tasked with seizing the road between the villages of Mametz and Montauban and beyond to a distance of some 3000 metres. 6 RBR was fortunate in being under the divisional command of Maj-Gen Ivor Maxse whose training methods were at the forefront of those in the BEF. Consequently, the two Berkshire assault waves left their trenches even before the British barrage was due to end but such was the adrenalin rush that the lead company was caught by the late detonation of a huge mine at Casino Point, a German machine gun nest. As the Germans emerged from their deep dugouts they found 6 RBR already in their forward trenches and not disposed to take prisoners. Within two hours, the Battalion had secured its secondary objective and by 6.30pm reached its final objective some 2500 metres from its starting point. On the day, this was exceptional and matched only by the similar advances of 30th Division and the French 6th Army just to the south of 18th Division. Elsewhere, the day did not go as well for the British – with 60,000 casualties of which over 18,000 were deaths, it is still ranked as the worst day in British military history. Among 78 killed in 6 RBR that day were both Hurn and Comley. Along with 6 other ranks from 6 RBR, the grave of Reginald Comley is to be found in Dantzig Alley British Cemetery, Mametz, while Freddie Hurn’s body was never found and his name is recorded among the 72,000 to be found on the Thiepval Memorial to the Missing in the Somme sector. Soldiers who served in France or Belgium as part of the British Expeditionary Force (BEF) between August and November 1914, had their service recognised in 1917 by the award of the ‘1914’ Star medal (known as ‘Pip’), carrying a clasp across the ribbon marked ‘5th Aug-22 Nov 1914’. The 1914-15 Star (which did not have a clasp but was also known as ‘Pip’) was awarded to all those soldiers not qualifying for the 1914 Star but who had served between 1914 and 31 December 1915. Thus was acknowledged the service of most who had joined the colours voluntarily before conscription was begun in January 1916. Both Stars were always awarded with ‘Squeak’, the British War Medal* and ‘Wilfred’, the Allied Victory Medal*, so were worn in a row of 3. Soldiers only eligible for the War and Victory medals wore them as a twosome, nicknamed ‘Mutt and Jeff’, all names being drawn from popular cartoon characters of the 1920s. These ‘campaign’ medals would be worn with any other gallantry or service medals that the wearer was entitled to. *The recipient’s service number, rank, name and unit were impressed on the rim of the two medals. The same details were impressed on the rear of the Star. Footman (Marjoram): The first footman lays the table for each meal, serves the family breakfast either on trays in the different rooms or in the breakfast or dining room, and attends the door during the morning. In households where but a butler and one footman are kept, the two alternate in tending the door. Gardener at the Cliveden Estate (Cheshire, Cowley, House brothers, Grey, Price) The gardeners at Cliveden house maintained the 375 acres of land. They did this using only metal and copper tools as machinery such as electric lawn mowers had not been invented yet. They also planted flowers, in particular they planted a seasonal mix of bulbs, annuals and shrubs such as gladioli, hollyhocks, tulips, pansies and azaleas. A groom or stable boy is a person were responsible for the management of horses and the care of the stables themselves. They would sweep the stables clean and prepare the horses with the correct equipment for riding. Cliveden’s stables were rebuilt during the ownership of the 1st Duke of Westminster (1868-1893), an important ‘stud’ farm for many years subsequently. .
An electrical engineer designs, develops and maintains electrical equipment, solves problems and tests equipment. They would have worked with all kinds of electrical devices, from small items to big. After the disastrous fire 1849, which destroyed the house, Cliveden was completely rebuilt in 1851 and then extensively remodeled by Lord Astor in the 1890s who gave the estate to his son, Waldorf on his marriage to Nancy Langhorne Shaw in 1906. Nancy proceeded to redecorate the house and modernise it with electricity which became an important service throughout the house. Waugh was assistant at Cliveden to his father, Thomas. Night watchman at Cliveden Estate (Hurn): At Cliveden Estate, a night watchman’s job would have been to guard the main building at the estate around it. Other trades: Woodman (Pheby), Oddman (Kitchener) otherwise categorised as ‘working at Cliveden Estate (Jewell, Wells). Abdey‘s occupation at Cliveden is not known, but his parents were ‘carters’. David Bilton, Reading in the Great War, 1914-1916 (Barnsley: Pen & Sword, 2016) n.p. Smales, N (2015). Taplow moments : a unique history. Bicester: Words by Design. The Royal Berkshire Regiment Great War Project. [Online]. [September 2018]. Available from: http://www.purley.eu/RBR0000.html. Battalion War Diaries 1914-1919, Royal Berkshire Regiment. Transcribed. The Rifles Berkshire & Wiltshire Museum. [Online]. [September 2018]. Available from: http://www.thewardrobe.org.uk/research/war-diaries/search. Commonwealth War Graves Commission. Cwgc.org. [Online]. [June 2018]. Available from: https://www.cwgc.org/. Imperial War Museum. Livesofthefirstworldwar.org. [Online]. [June 2018]. Available from: https://livesofthefirstworldwar.org/home. Wikipediaorg. [Online]. [29 June 2018]. Available from: https://en.wikipedia.org/wiki/Cliveden. The website https://www.phrases.org.uk suggests that the full saying “There are three kinds of falsehoods, lies, damned lies and statistics” is from Arthur James Balfour, 1st Earl of Balfour, as quoted in the Manchester Guardian, 29th June 1892. No matter, but worth noting that the public has been very wary of government for at least 120 years on its choice of statistics to use to back its decisions or blow its own trumpet. It is no surprise to any of us in Education that the UK Statistics Authority (UKSA) has now chosen to write to the Department for Education (DfE) for the fifth time; it has already done so on four occasions in the past year about its use of statistics, it said in a letter to Damian Hinds, the education secretary. It is now investigating this fifth complaint, on international comparisons of school funding. Sir David has called for a meeting with Jonathan Slater, the DfE’s permanent secretary, and sought reassurance that the DfE would “observe the statutory code of and sought reassurance that in future the DfE would observe the statutory code of practice for statistics. What worries us all in Education is that whenever we hear the parliamentary representatives with responsibility for Education, such as Damien Hinds, Secretary of State or Nick Gibb, Schools minister, they speak with great authority and confidence of a state education sector that none of us actually recognise, in terms of funding, teacher recruitment and curriculum matters. Given the high level of anecdotal evidence that funding has been slashed to the bone arising in individual schools throughout the country, highly visible in news bulletins and indeed Court decisions highlighting the same, I really don’t know how the DfE or indeed its master, the elected government finds it in their water to sustain a conversation using statistics for which there is no integrity, and for which its own watchdog has called it out. Indeed they do Sir David, indeed they do. I am an avid listener of the Radio 4 statistics programme, More or Less, in which its presenter Tim Harford challenges broad sweeping statements made on the media that might not actually be true. Last week (14 Sept) was entitled “Male suicide, School ratings, Are female tennis players treated unfairly by umpires?” You can find the broadcast here, https://www.bbc.co.uk/programmes/b0bh8vpd and the section I ask you particularly listen to is from 6m50s, when Tim turns his attention to the claim of the chairman of the Conservative party, Brandon Lewis this August that “Since 2010 the number of pupils in good or outstanding schools had risen from 66% to 86%”. To be honest, Mr Lewis is just quoting the DfE’s own recently statistics, so how could his claim be exaggerated? It has been well publicised that Ofsted no longer has the resources to do everything, so its current focus is on moving schools from the bottom 2 categories of ‘inadequate’ and ‘requires improvement’, inspecting them quickly to move them upwards, rather than reinspecting ‘Good’ and ‘Outstanding schools’. ‘Good’ and ‘Outstanding’ schools are not expected to be inspected in perhaps less than a ten year period, so inevitably, there is going to be a ratchet effect lifting standards, with there only existing a one way ticket upwards! Even more confusing is that some 700 failing schools have been ‘closed’ and reopened, which ‘erases’ their ‘inadequate’ rating and they won’t be inspected for a further 3 years – in the meantime they enter that twilight zone of invisibility. Education journalist and researcher, Laura Mcinerney helps put sense to the statistics in the broadcast, and is challenged to explain why the changes in the exams structures at GCSE and A level damage the research base further. Regular readers of this blog will have read me bang on about this before, but I love the fact that McInerney (whom I have admired since her days writing on Twitter as a Fulbright Scholar back in 2014) is affirming my thinking. Every GCSE and A level has been so substantially changed now, that there is no way we can compare the statistics of the past with pupil performance now from 2018 onwards. For any research to be of value, you need at least 5 years of data, so it’s fair to say we will not know whether the changes that have been brought in have raised the standards of education in England as the DfE (led by Mr Gove at the time of initiating these changes – back when McInerney was stateside 2014) until 2023 at the very earliest, given that the new style GCSE exams only hit Bus Stud and Tech in 2019. Almost exactly the same set of circumstances have preceded the changes to the public examination system in England. The Education departments in both Wales and Northern Ireland were able to ‘stay’ the changes, and have reflected more carefully on what is actually needed in their jurisdictions. It’s quite one thing for maniac politicians to insist on changing the content and style of examinations within its schools, but you’d think as a profession we could have caused some restraint so that the outcomes of such change could be tested and unforeseen circumstances made more visible prior to final implentation?. McInerney concludes “The amount of change that has gone on over the past eight years makes it almost impossible to compare anything. Even these Ofsted grades have different marking criteria since 2010… We can’t even take a small group, for example pupils that are on free school meals, because the criteria for a child qualifies for free school meals has changed over the last few years…”. and continues: A “superhead” of an ultra-selective London grammar school left sixth-formers feeling suicidal and staff feeling bullied with a “constant emphasis” on perfect exam grades, a report has found. The article finishes with “St Olave’s has promised to judge future performance against a broader range of criteria”. The trouble with the concept of judging performance for 21st century school leaders is that almost all the desirable outcomes required in good schools are immeasurable for the purposes of judging performance; as with all elite performance, you must concentrate your resources on looking after the individuals in the team, treating them as individuals and managing their needs accordingly. The outcomes for students leaving the Sixth Form are going to be very different to the needs the pupils had identified on entry in the school at age 11, and dependent too on the emerging skills and talents the children display as they rise up through the school’s many channels of provision. If a school chooses to measure itself by Russell Group University admissions, then it is then requiring of its Sixth Form leaders and Careers guidance counsellors to put destination more important than career choice. One of our own staff’s son revealed to me the other day (attending Sixth Form elsewhere), “the anger on the face of the Headteacher was all too palpable when they heard I was choosing Oxford Brookes over Russell Group for my chosen degree course”. No wonder such schools are shutting down A level Art, Drama, D&T, Music and Sports as subject choices, because such subjects point at Art School, Drama or Music College or worse still, a career in these and Sport rather than the pursuit of a degree. Unsurprisingly, all the above routes are open in our Sixth Form, and whilst all the above is true, I do actually feel we are serving the individual students best this way as well. Shakespeare, Charles Dickens and Wilkie Collins to name but 4 of many. All of these made their living be selling their stories to the masses, to entertain the troops so to speak; the inspiration we drew as children from the Knight’s tale, Macbeth, Christmas Carol and the Woman in White led to the creation of tabloid press articles, cartoon storyboards, versions with alternative endings as well of course as derivative versions, and on occasion, wholly new writing and poetry of our own. Undertaking the research last decade on what had been lost during the ‘nationalisation of the core curriculum’ brought some pretty terrifying evidence to the surface; not only had the volume of engaging and inspirational activities been reduced, but too much exploratory work was being replaced with rote learning and worksheet, and for no good purpose. Teachers wondering where their source material for exploring challenging issues and raising the resilience of the children in their care need look no further than the classics, and most teachers recognise that they include all the same arguments that suffuse parliament, the press and the entertainment media today. We welcome the challenge to ensure that children are engaged by the history and writing of the past and highlight that the issues are all still very much alive and entertain us all. Whilst not a avid viewer of Love Island, I understand Dani and Jack are the bookies’ favourites to win the programme’s £50,000 prize (Monday 30 July); I haven’t missed the supporting story either, that more people applied for Love Island this year than to enter Oxbridge, nor that Love Island Competitors can expect to have higher life term earnings as well than Oxbridge graduates. Whether D&Js story will be as sad or compelling as Romeo and Juliet only time will tell. I am not suggesting that schools should focus their charges on careers requiring such vanity and plastic surgery of course. What I am recommending is that schools should set out to educate as much of each child as they can, collaborate as much as possible on a whole host of common enterprises and cause the children to ‘sweat hard on the good stuff’. Testing is of course one of the requirements to build up the perspiration but only that, and not too much of it early on – all the other components need to be in place as well. The nature of a school year, and indeed the success of putting learning under test, inevitably means we will have a lot going on this time of year! Sports Days, Speech Days, Prize Givings and Activity Weeks all play their part in enabling opportunities for competition, collaboration, risk-taking and leadership. There will be successes for some, failures for others too, though for the vast majority, we hope a real sense and pride in achievement, whatever the results. The story of the English football team fits this pattern, achieving far beyond expectations and clearly not quite ready to win the World Cup…yet. For all the disappointment visible for England, the bigger football story across the world has been the remarkable rescue of the 12 boys and their coach, where they had been entombed in the Luang caves in Chiang Rai, Thailand. The incredible skill and expertise of the professional divers had been built up over years, enhanced by an incredible willingness to trust each other to work as a team. Both examples prove to be an inspiration for our own pupils, a reminder that hard work coupled with meticulous planning provide the gateway to success in life. Our country’s leading public servant, the Rt Hon Theresa May MP, has faced her fair share of challenges recently, and it’s amazing that over her Chequers summit and cabinet resignations, she had time to pen this lovely letter on Sunday 8 July. 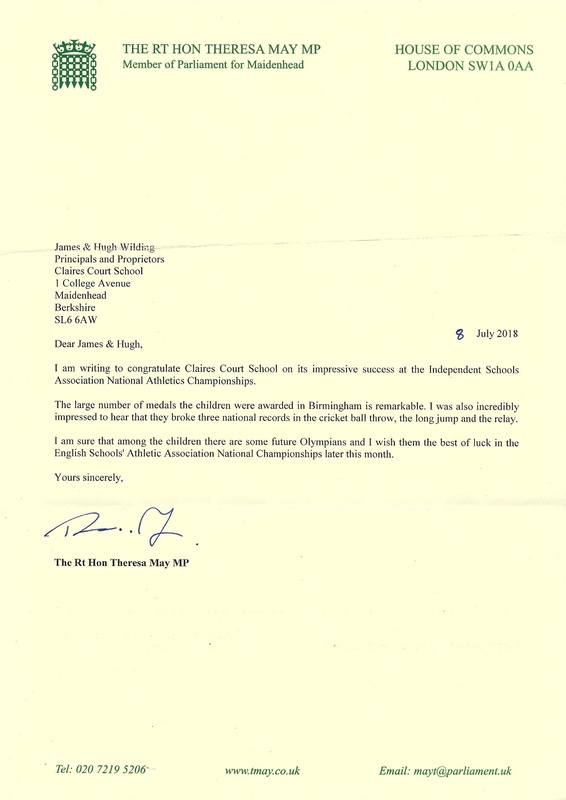 That is a priceless example of the meticulous attention to detail Theresa has become famous for here in RBWM, sending congratulations to our athletes aged 8 to 16, who could indeed be our future stars. More are on their way already, with the J16 coxed quad selected to race for Great Britain v France this week. Look out for the names of Toby Stubbs, Alexander Getley, Leo Griffiths and Jake Wincomb, delighted of course at their first taste of international competition, though not quite so pleased with their result, losing by two lengths in Paris. Please turn your eyes towards the Women’s Hockey World Cup taking place later this month at the Olympic stadium in Stratford, where our own Ellie Rayer (1999-2015) will be representing England, first game against India on Sunday 21 July. To conclude, very many thanks to all pupils and parents for their wonderful support this year. In addition, I thank the headteachers and their staff for their amazing work, without which our school could not thrive. We bid farewell to Andy Giles, Head of Sixth Form, to Penny Hawker, Deputy Head Senior Girls, both of whom have been remarkable leaders in office and we wish them well as they move on to new challenges. I look forward to Justin Spanswick moving into executive headship alongside me, and continuing to work with our other heads to ensure that the pupils, parents and families of Claires Court are at the forefront of what we do. Have an excellent summer break , I feel sure we all deserve it!